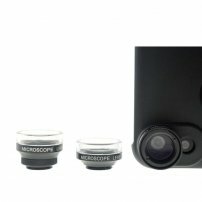 2.8X HD Macro / 20X Microscope / 30X Super Microscope Lens MacroPro for Apple iPhone X / iPhone XS : allputer.com - Accessories for all your Portable Electronics & Computers! Macrophotography and Microphotography are fun, the amazing point is that you can take stunning pictures / videos even you are a photography beginner. No technique and talents required, what you need are lenses and patience. You can even use these lenses to explore the amazing micro-world around you, no matter in the gardens, in the countryside, even with old furnitures, your skin, your clothes, your hair can be something very stunning and amazing! As long as you are using a smartphones, this set of macro lens / microscope lenses can help. The 2.8X Macro Lens is designed for taking HD pics and vids, it is not other macro lenses in the market can compare. The 20X Microscope helps to capture in distant, tiny world, explore the nature of the world easily, best for parents and teachers. The 30X Super Microscope let's you get the microworld, the microworld is sometimes as fascinating as world's most-visited tourist attractions. It is very easy to use. No complicated phone adapter required! No complicated microscope, you don't need to rotate the screws again and again to adjust a fit position over and over, just have the included cover on your phone, the lens on the cover then turn your phone to photo mode (or video mode) and all fixed! When you don't want to use the lens, just unscrew the lens and go. The lens is so compact and light weight, you can have it in your pocket with no bulky! - BIG SAVINGs: One purchase for long use, the lenses are still usable when you change to a new phone, say iPhone X, Galaxy S10 or even others - HTC, Sony, Huawei or so), so when you got a new phone, just check with us if we have such cover, then you just need a new cover instead of buying a new set. - Use your mobile phone as a microscope in an extreme easy way! - For phone model with DUAL LENSES, only one of the cameras - the main one will use with the add-on lens, the other camera may be hidden by or not compatible with the add-on lens. - As a result of our continuous improvement, we may change the lenses from time to time, we cannot guanantee the lenses for this model will be able to use with future models even it remains yes so far. - The phone cover may be packed independently out side of the pack for Lenses and accessories, but no worries, it will be in 1 shipment.